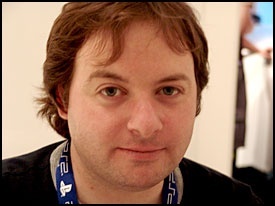 Outspoken game designer David Jaffe is trying to teach himself that on the internet, silence is golden. So he's going to see if he can "just shut the f**k up" for the next six months, and he's even willing to make a wager on it. When David Jaffe says something, he typically does it in the loudest way. Caps Lock pressed down so hard there's a fingertip groove in the key, expletives soaring across the internet, Twitter used in exactly the opposite way it's meant to be. 140 characters? Not enough for David Jaffe. As it turns out, when David Jaffe decides to keep his mouth shut, he still can't help but be outspoken about it. Jaffe has effectively banned himself from the internet in an attempt to teach himself the lesson that we all have to come to terms with eventually, no matter how wrong everybody else online is: it's just not worth it. "One day I will learn that it's just not worth saying a damn thing," Jaffe wrote on popular message board NeoGAF. "Which really- to be fair- is the smart way I should be doing things. Let's make a deal Neogaf...right here, right now. Let's see if I can JUST SHUT THE F**K UP for the next 6 months." So Jaffe has suspended his Twitter account and his blog is now invite only. His YouTube channel still seems to be up, but I'm not sure it'll stay that way. Might want to download some of those classic vlogs in case you can't go half a year without watching Jaffe talk to his webcam and wear funny hats. I recommend his take on Sarah Palin, an oldie but a goodie. And the thing about Jaffe is that he knows how outrageous he is and how outrageous he can be. So he knows that doing this whole Six Months of STFU thing, as I'm calling it, won't be easy for him. Therefore, he's instituting a wager. If he breaks his promise of not voicing his opinion on anything other than the game he's currently developing and you manage to be one of the first three people to call him out on it, well, he'll give you a free copy of his game. A free game, for telling a game developer that he's talking too much about something that's not his game. I'm not sure who to cheer for here.